*What an absolutely glorious day I experienced today. The weather was perfect. The company was wonderful. Projects were completed. Who could ask for anything more? *After my morning walk, I had my coffee, then headed over the the Kellogg School District office to meet with Johanna, to talk about what happens when I end my employment this summer. Do I resign? Do I retire? Can I retire? I left with more questions that will need to be answered in the coming week. *One of the jobs on my list was pruning my roses. I had watched a video on this, and I realized I didn’t have the correct pruning tool. So I went to ACE Hardware and bought the correct pruning shears, some working gloves, some seeds, some bulbs and some petunias, because they had just put out their plants for sale, and I thought I had better buy these pretty petunias before they run out. Aren’t they cute? They are lime green with a magenta stripe. *Earlier this morning I had received a text from my sister-in-law Debbie wondering if their two Corgis, Maggie and Charly, could come spent the afternoon with me while their home was having some fogging done to it, as part of their renovations. So Bill and Debbie arrived with Maggie and Charly around 11:30 or so, and they hung out here until they got picked up around 3:30 or so. I enjoyed a nice visit with Debbie while they waited to take the dogs home. *As I started pruning my roses, my friend Kellee came by, and we had a marvelous visit, and caught up with each other, and what has been going on in our lives. At one point, Kellee ordered us both lunch from Best Shots, and she went to pick them up. We had a wonderful, wonderful time together, and be both didn’t want our time together to end. *All the roses got pruned and fed and one I transplanted to a hopefully better location. I watered them, and they all look like there are getting a good start this spring with lots of healthy leaves. I can’t wait until they start blooming. *As part of their house renovations, Bill and Christy are both getting rid of their bathtubs. Their two bathtubs were delivered to our home today. We aquired them to put in our backyard to use as planters. So those two tubs were both put into place, ready to be filled with dirt and plants. We now have the three bathtubs from 514, 516 and 518 West Cameron Avenue in our backyard. I can’t wait to decide what will go in them. *Taking advantage of the fact that the soil has dried out in my raised beds, and that we are suppose to get rain tomorrow, I thought today would be a perfect day to plant some of my “cold crop” seeds in the garden. In two of the raised beds, I planted peas, brussel sprouts and cabbages. In some old tires along the fence, we planted spinach, two kinds of kale, Swiss Chard, and five different kinds of lettuce. Probably over Memorial Day Weekend, I will plant the summer squash medley, the green beans, and the cucumbers. I will have tomato plants also. *While I was busy working on all my gardening projects, Paul continued working on getting lights strung around our patio. 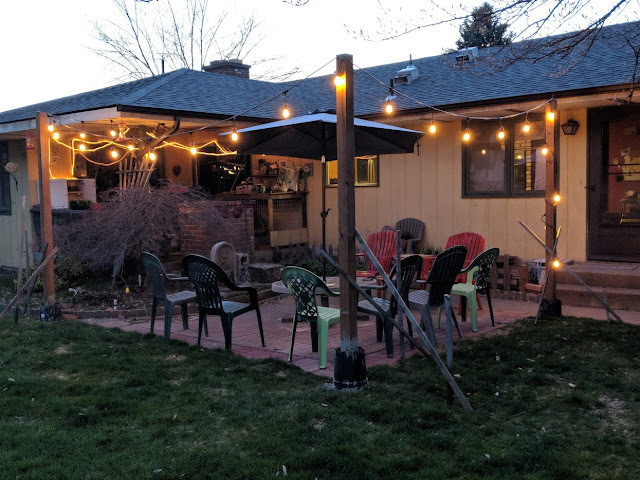 He completed getting the lights up by nightfall, and we enjoyed sitting out on the patio with a wonderful soft glow of light surrounding us as we continued to enjoy the pleasant evening in our Kellogg backyard.